So I’m one of those people that is almost always cold. I don’t know why, but it must be genetic because my mom and my daughter are too. And when I go to quilt retreats, I am extra cold (some quilters like it brisk! ), which makes it hard to sew. 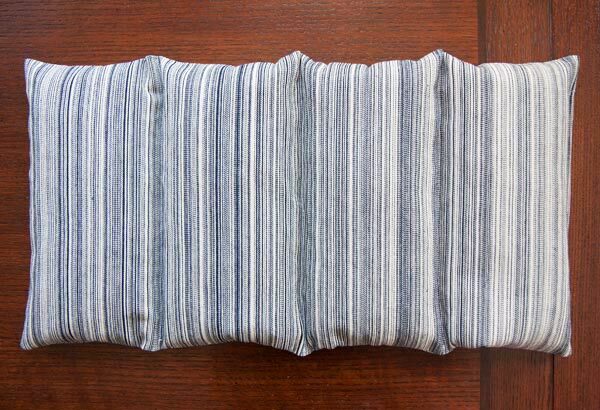 Last year I had the idea of making a giant, lap-sized hot pack to keep myself from shivering through a weekend retreat. It really worked! I started using it at home too and it was so lovely and cozy all winter long. The hot pack I made is close to the largest size pack that will fit in a regular-sized microwave. This extra large size is so versatile, and the four segments keep the filling in place when it’s draped over you. I use it in my lap to keep warm, both at home and away. I heat one up periodically throughout the day. I’ve curled up in bed with this pack in front of me when I’ve had tummy aches; the heat works wonders. My children, niece, and nephews heat up these packs before they go up to bed in the colder months to use as foot warmers in their chilly beds. My mom uses it to soothe the aching muscles and joints in her entire back all at once. My MIL uses it to comfort her sore knees or neck and shoulders when she’s having an arthritis flare-up. My dogs snuggle up next to it sometimes when I leave it on the couch and it’s still warm. It is such a wonderful thing to have around! I will definitely be making more as gifts in the future. Note of caution: when researching hot pack fillings, I came across many people complaining their hot packs burned or started to smell really bad after heating. It is absolutely essential to put a mug of water in the microwave at the same time as you heat your hot pack. Without it, your pack could possibly burn or catch fire, and you can damage your microwave. If you give hot packs as a gift, be sure to mention this to your giftee! The first time you heat up a new hot pack, heat it up in 30-second intervals, testing after each interval, until you learn how long it takes to heat up your pack without scorching it. Different fillings all vary wildly with how long they take to heat up, so it’s not only the volume of filling that affects the heating time, but also the type of filling. And some fillings, like corn, get way too hot if you heat them too long. 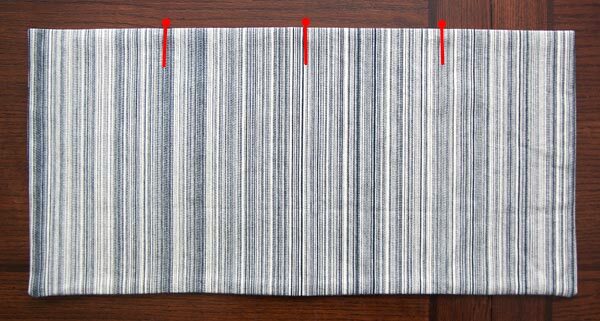 Fabric: I made the ones for my family out of this pretty Robert Kaufman railroad stripe denim. With a hot pack this large, you’ll want to use a sturdier canvas, linen, denim, or home dec-weight fabric. I used a piece slightly larger than a Fat quarter because I had yards on hand, but you could use a Fat quarter and just make yours a little smaller. 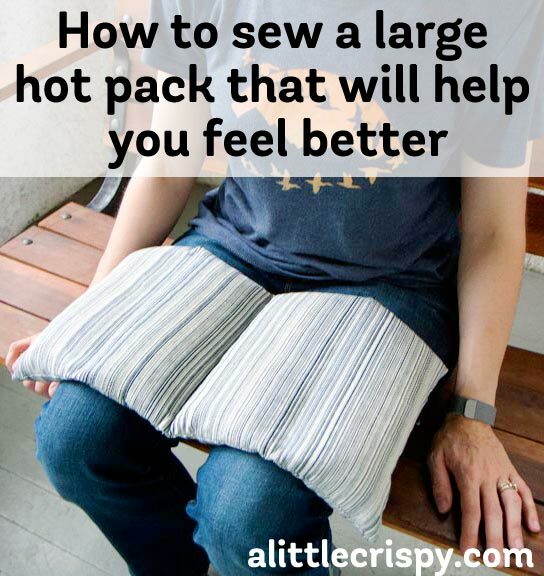 If you purchase a half-yard of fabric you will be able to make two hot packs. The instructions below will work with pretty much any size piece of approximately square fabric. For each hot pack I made, I cut one rectangle 20″ x 21″. If you have a smaller microwave, measure the depth of your microwave, double that number, and subtract a couple of inches, then cut out a square that is that size. Filling: You will need about 12 cups. I use whole feed corn (not popcorn! ), but you can use any filling you like. Read my post on What filling makes the best hot pack if you aren’t sure what to use. 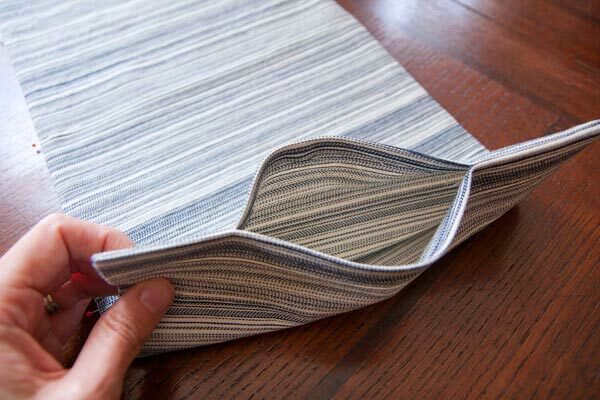 Fold your fabric in half, right sides together, to make a 10″ x 21″ rectangle. 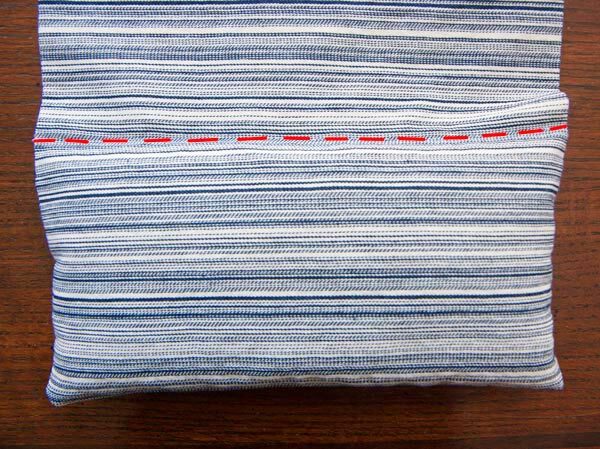 Sew all the way around the outside with a 1/4″ to 1/2″ seam allowance, leaving a gap on a short end. Don’t clip the corners (it will add extra strength to leave them intact). Turn the pack right side out, poke out the corners, and press. Fold the pack widthwise into quarters and press each of the three folds to crease them. Then, reopen the pack and mark the three crease lines with pins along the edge. This makes the crease lines easier to spot. Through the gap in the short end, pour in about 3 heaping cups of filling. Push the filling down to the bottom at least 1/2″ below the lowest crease line and pin across the width (red “pins” as illustrated below). This will hold the filling in place while sewing. 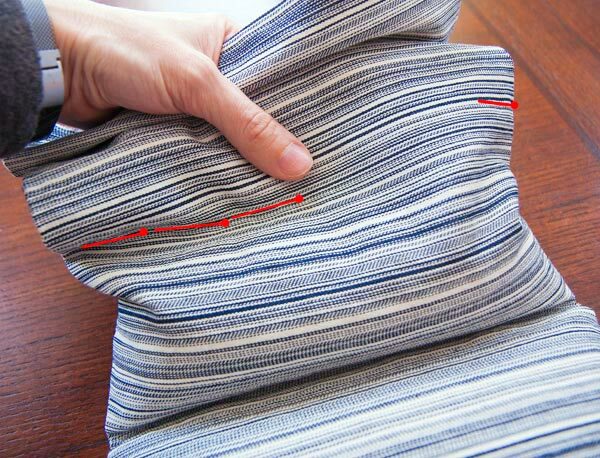 Stitch across on the creased line (not the pinned line), backstitching at each end of the seam. Remove the pins for this compartment. 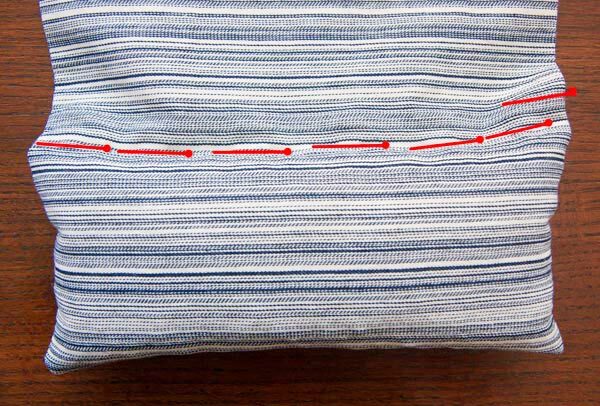 Repeat the previous two steps with the next two compartments/crease lines. For the last compartment, add your filling, clip the opening shut and sew across with a 1/8″ or less seam allowance, being extra careful not to hit any filling pieces with your needle. You can also handstitch the opening closed if you prefer. And that’s it! Fold it in half to fit it in the microwave. Don’t forget the mug of water! If you want a washable cover for your pack, you can sew a simple rectangle as the pack isn’t washable as-is. 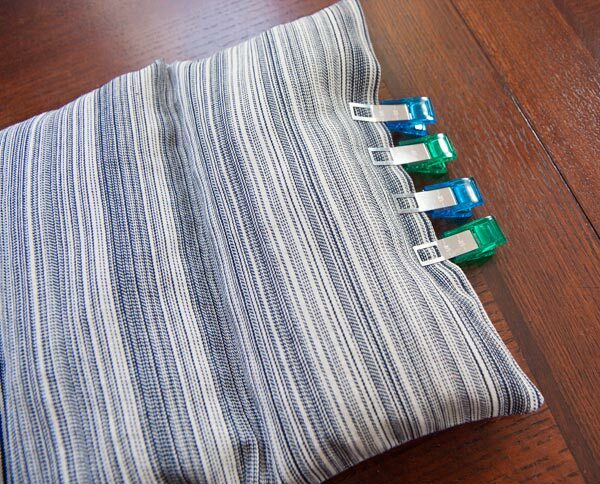 If you wanted a super quick and easy cover, you can use a pillowcase. Since making this pack I’ve felt so much more comfortable in chilly rooms. I hope it helps you too! I am also a cold person. Sometimes I sit with a hot water bottle in my lap while I am working but they often slide off. This looks perfect. Looking forward to trying it out. Thank you for sharing the idea and the instructions.